Katoora Lake (also called Jaz Dand) is situated in the Lamoti Valley of Upper Dir, KPK at an altitude of 11,500 ft approximately. Most of the time, this lake is surrounded by high mountains covered with snow. The best season to visit it is August/September. However, June and July are also good months for a tour, if you are prepared for random monsoon showers. The level of difficulty for trekking in the area may be considered ‘moderate’ for regular trekkers/hikers. 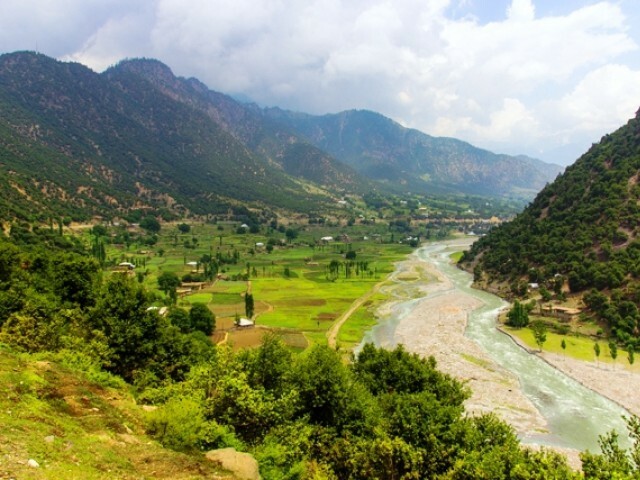 Travel towards Jaz Dand actually starts when you reach Upper Dir – a location that can be reached from Islamabad within seven hours or the Swat Valley through Badgoi Pass. From Upper Dir, it takes almost five hours to reach the base camp in Jandrai (also pronounced as Zhandrai). At this point, one has to leave the road (as there is none!) and start trekking towards Jaz Banda. It takes another five hours of trekking in dense forests to reach the destination. I would advise tourists to stay a night in Jaz Banda and then trek towards the lake – this will take you close to three hours. As far as accommodation is concerned, the best option is to set up camp, as my companions and I did. However, for those who are not comfortable with camping, there is one private rest house in Jandrai and one in Jaz Banda. These rest houses are owned and managed by Mr Raja Taj Muhammad. He is a renowned personality of the area and has been promoting tourism and serving visitors for more than 10 years now. The serenity in the atmosphere puts pains and troubles out of your mind and puts you in a state of peace from where there is no return. One simply cannot forget the time spent there. We spent a night in Jaz Banda, trekking back the next day to continue our adventure through Kumrat Valley. Personally, I wish to just live here; streams of fresh, chilled water emanating from the lake, high snowy mountains, meadows spread over large expanses, the fresh and pure air – there are so many reasons why this place is absolutely beautiful. Here, you will find yourself closer to nature. For those who travel alone, this spot offers pleasant company – here, the clouds won’t leave you at any point. As for the lake itself, it takes your breath away for a moment, and then it recharges your mind with its freshness and glory. Just writing about it has me wishing I could go back! Of course, we cannot possibly overlook the terrific hospitality shown by the local community of the area. People here are simple, kind and hospitable. Mr Raja Taj Muhammad, the owner of the rest houses mentioned above, is a prime example. We were so impressed by his hospitality that we recorded an interview with him, requesting him to brief us about this place and shed light on the area’s security situation. During our trek, we met many people who offered us a cup of tea, extending a hand of friendship in their own hospitable way. These people are pursuing a very simple life and eat plain yet healthy food. In pure economical terms, their cost of living is very low. One can guess their general political views via flags and banners of various political parties. These people are self sufficient and this is evident from small irrigation channels and small-scale electricity generation facilities. I personally feel that a better infrastructure would bring more prosperity to the area and make life easier for these people. They have great respect for their customs and traditions. As a general rule, it becomes the responsibility of travellers to get familiar with and show respect for these local community manners. A special plea to my photographer community – pack your bags and visit this place as soon as you can. It is a brilliant opportunity for your work and can indeed bring you fame through the eye of your gear. As for general adventure-fans, trekkers and travellers, Katoora Lake is an ideal spot for you to explore for your next vacation. Amazing pictures……………building a decent road would be a double edged sword……..good for small economic activity but bad for the environment, just look at the mess Murree has become. I cannot believe that my hometown Dir is so beautiful. I want to visit this place at the earliest. I’m really awestruck… this place is so beautiful. Thanks for sharing Murtaza Mahmud. May the serenity & beauty remain preserved and may no telecom towers or loud speakers scar the at peace landscape. As an Indian, I have no hope of being ale to go to this place but perhaps in addition to the interview, if you provide the contact details of this Taj Mohammed e.g. Mo bile number or address, more Pakistanis maybe ale to enjoy such a wonderful gift from nature. Refreshing article and breathtaking place! @Murtaza Mahmud: Appreciate your response but your comparison to Switzerland made me laugh………..but then I suppose there’s no harm in trying to copy one of the best. Our Northern Areas…. Simply the Best. Last year I visited Mansehra – Bala kot – Kaghan – Naran (From Karachi till Naran on my Car Coure with family, and onward by Jeep) then Jheel Lalusar – Babusar Top and Jheel Saiful Maluk, the Siri – Pai (on return route). It was an amazing experience of our life. On each stop, me and my wife simply thanked Allah for giving us opportunity to see these places. Why you have no hopes of going there? Simply awesome and lake is really beautiful ….great photography done. Brilliant efforts Murtaza and your team for exploring this God Gifted Paradise!